We would like to send you our warmest thoughts and best wishes for a wonderful holiday season and a very happy new year. We’ve had a fantastic 2017 at videantis and we’re happy to be working with some of the best companies in our field. 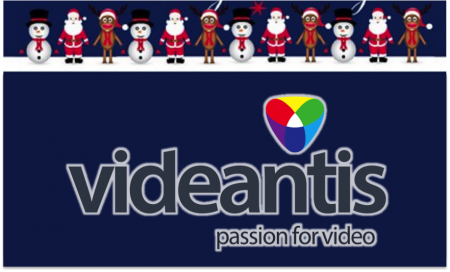 On behalf of the whole team at videantis, we would like to thank our customers, partners, and investors, and are looking forward to a great 2018. Earlier in December we announced that we are partnering with ADASENS (part of the FICOSA group) to bring advanced sensing technologies to self-driving vehicles and automotive ADAS applications. This partnership combines the ADASENS portfolio of computer vision functions with videantis’s low-power, high-performance embedded vision processor. 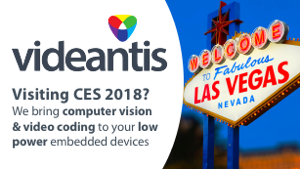 Videantis will show an automotive camera by FICOSA that has the ADASENS algorithms running on its embedded vision processor at CES 2018 from January 9-12 in Las Vegas. To most people, Las Vegas is known for its casinos and nightlife, but for us it’s primarily the home of the largest consumer electronics show in the world. More than 170,000 people will again gather to discuss the very latest tech for VR/AR, robots, IoT, drones, mobiles, and 8K displays. Many major automotive OEMs and Tier 1s are demonstrating their latest developments. Computer vision and imaging were hot topics at CES in previous years, and we’re expecting that trend to continue. In our private suite, we will be showing many computer vision demonstrations. 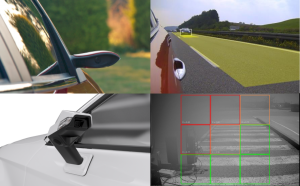 As mentioned above, we’ll show an automotive camera from ADASENS/FICOSA as well as Structure from Motion/SLAM, different object detectors, optical flow, and OpenCV acceleration, all running in silicon on our own multicore, high-performance, low-power processor architecture.